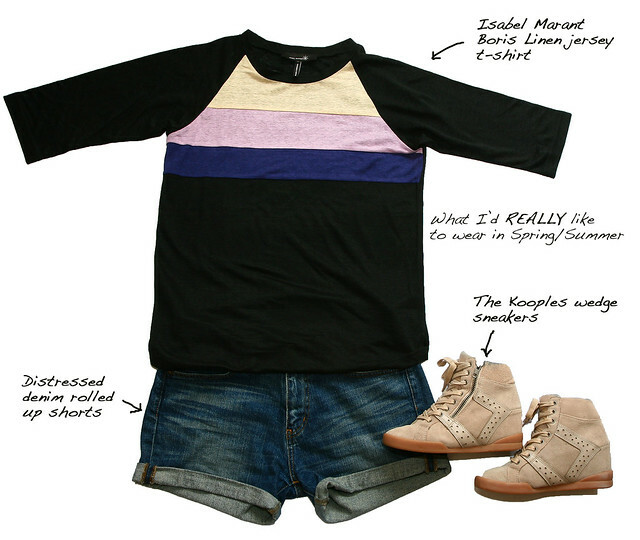 Outfit: Isabel Marant Boris T-Shirt, Uniqlo rolled up denim shorts (similar here or here) and The Kooples wedge sneakers (similar here). I used to think that it's such an English thing to moan about the weather. Now that I'm living in the UK, I've concluded that the temperamental weather is enough to drive anyone to despair. The ominous dark clouds are forever looming overhead so a ray of sunshine may disappear within a blink of an eye. I used to live in flip flops and shorts in New Zealand. Here, I'm always prepared with a jacket, raincoat, appropriate footwear and an umbrella because frankly speaking, the drowned rat look is not in vogue these days. See what I mean? I'm moaaaniiinng. 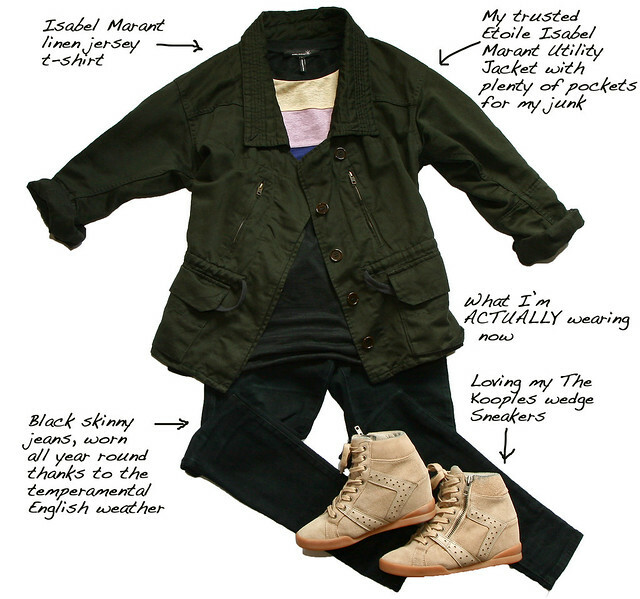 Outfit: Isabel Marant Utility Jacket (similar here ), James Twiggy jeans (U.K here), Isabel Marant Boris T-Shirt and The Kooples wedge sneakers (similar here). Lol! Yes, well today and for one day only you can indulge in the first outfit :-) It's so sad that we've come to have a 'fantasy dressing' situation due to lack of a Summer for the 2nd year running in UK. Great looks! still loving that marant jacket! love both looks - those sneakers seem to go with everything huh? hopefully you'll have a better summer next year because i'm planning to visit! It's supposed to be 97 degrees (or I should say 36 degrees!) here today. You can take some of that heat please. You totally have the rights to complain becayse if i lived there i would probably express my pain and agony in the same way. I can only handle so much of rain and cloudy days. Love what you put together here, the first assemble is childish and fun while the second assemble is chic and playful. According to the weather here, i will have to go with the look # 1. The salmon burger patties were a store brought version which taste sooooo good, you wont get that salmon unique odor. They make them fresh and ready to put on the grill. I will have to examine closely and decode what they put in. Two of the ingredient that i can taste are fresh basil and lemon juice. Love the first pairing the most, perfect for Dubai weather. I love England, maybe because I spent like 10 days per visit but I know that the weather can be terrible. I've experienced cloudy, rainy and sunny all within 5 minutes in England! Isn't it just! It's gone from hot to freezing to hot today, I'm giving up trying to dress. Love your sets, you are one cool cat. you have IMPECCABLE taste, i love IM. And i would wear that entire outfit too! Do they still sell all the items pictured? Unfortunately, they're all from previous seasons. The Kooples sneakers are on sale at the moment if you're interested. great post love both outfits and i am SOOO into those shoes. Today, I would go for the first regardless of the fact that I don't have the legs for it. The second would suit me better and I do love the jacket - perfect proportions and excellent pockets! And what's that about the Kooples sneakers in the sale ... you are the temptress! They're down to £176 from £220. I even had a 2 year old who walked up to see to say she liked my thoothes. Can't argue with a 2 year old princess, right? Did she like your thoothes? Little Fashionista in the making. Might take little George into the Kooples tomorrow (he's my get out clause if it gets too much for me with all those fashionable assistants in there ... and it's always empty in the Leeds store so they will stare at me even more). Super cute looks! Loving the 2nd one! Adorbs! Brilliant tee shirt - I love linen and the stripe detail! So sorry abut the gray - at least I know how to pack for my summer visit! I love that utility jacket!!! been on the hunt for the utility jacket, but unfortunately had to give up :( great pairing! I love these posts. No matter what we're wearing don't we always wish we were wearing something else? Love both outfits! And agree with Lindsay - we always wish we were wearing something else! Fantastic outfits! I'm so in love with your wedge sneakers. I'm always moaning about the weather too. We're having a heat wave now so I would love to have some cooler temperatures.